De driedaagse Delphi 10 VCL Essentials training start binnenkort, op maandag 25 maart 2019 op de mooie locatie van het Jachthuis Beukenrode in Doorn. De training is bedoeld voor developers met enige ervaring in programmeren. 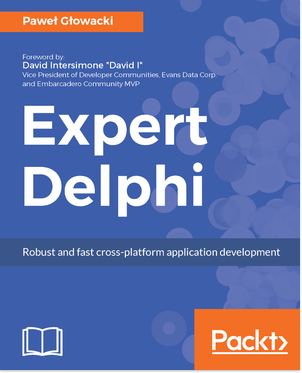 Maar ook ervaren ontwikkelaars waarderen hem, niet alleen door de overview van alles wat je met Delphi en de VCL kunt, maar ook door de deep-dive in details als de event-loop en de interne werking van de VCL (visual component library) en RTL (run-time library). In de driedaagse training leer je je Windows applicaties maken met Delphi, gebruik maken van een database via FireDAC. Verder in-memory en local datasets, debugging, de RTL, Windows-10 styling en zelfs wat generics. De training gaat zeker door, dus voor de reeds ingeschreven deelnemers, tot binnenkort! Thank you for watching my session on Modernizing your VCL application at CodeRage XII. The zip file is password protected to add some level of security to it. The Windows-10 styles can be modified or appended with your own styling using Tools | Bitmap Style Designer. When using a TTask to get things done in the background, avoid sharing resources with the main thread. Either disable access from the main thread to these resources or create copies for the TTask. After that feedback the results to the main thread using TThread.Queue or TThread.Synchronize. When using TTask, use a task-based approach just like you would in the real world when you let a colleague do a task. Just delegate an entire task with the required resources (memory, file handles, connections, datasets) to a TTask and allow the task to feedback its results at the end of the task. Avoid using locking as this can easily lead to deadlocks, waitlocks and other blocking effects. When using Change Views keep in mind that the first time a subscription is activated on the Change View it will return all records, as it does not yet know which records you have already received for the specified subscription identifier. Change View subscription identifiers should be unique but repeatable for each running application instance. Create an identifier, such as [MachineName+UserName] and use it to activate the subscription. If the application is stopped and then run again, it can activate the subscription using the same identifier, so you will get the changes back again.